As with learning any new skill, it’s important to understand the key concepts and basic vocabulary. Even if you will be out-sourcing the SEO of your website to an agency, it will be very beneficial for you if you understand the basics. To give you a head start on SEO and the processes behind it, here is a guide – an A-Z, if you like, of all the basic terms associated with SEO. Alt Tags, or alternative text tags are used to describe images that are used on a web page. They allow Google to identify what an image is (as Google cannot yet read images). Article Marketing is an SEO technique that onsists of the online distribution of an article written by you, on a subject related to your business. This is then published all over the web, creating important backlinks to your site. Google cannot see websites like humans! It is important to remember all they can see is the code that is behind the website. So, for example, if your website is created solely in Flash, and there is no text in the code, Google will have no idea what your sites about. HyperText Markup Language is the predominant mark-up language (that describes how the text should be appear on the webpage) that websites are written in. You can think of it as the basic building-blocks of webpages. Inbound links (or backlinks) are links from external web pages linking back to your site. Not only do they encourage new visits to your site, good quality, relevant inbound links can have a great impact on your Google Page Rank – and so your place in search results. A keyword is a word or phrase that explains what your website is about – it is a term you wish to be found for in Google. 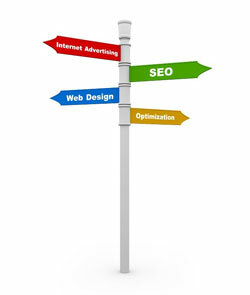 For example, if you are a Digital Agency, you might choose keywords such as “web design London”. Meta Data is information hidden inside the website which lets the search engines know what it is about. It includes the “Page Title” – which explains what the specific webpage is about, “Meta Description” – a short summary of the pages content, and “Keywords” – key words that describe the pages content. In terms of letting the Search Engines know what your website is about, Meta Data is very important. Organic Search Results are the search results that are NOT paid for/ sponsored. Whilst PPC (Pay per click) and other paying results can be a short term solution, organic results are key to long-term success. These are the links on your webpage that link to other (external) webpages. Page Rank (PR) is a ranking out of ten given by Google for every web page based on how important Google thinks the web page is. 10 is the maximum ranking (although only a handful of websites, such as Facebook and the US Government website have reached this). A higher Page Rank can hugely affect your Google search results position. Pay per click is an internet advertising model used on websites, where the client only pays if their advert is clicked on. For search engines, these adverts are linked to specific keywords. Search Engine Optimisation is the process of optimising your website so that it appears on the search results of the search engines (most commonly, Google) for your desired keywords/phrases. Any other words/ phrases that need to be added to the list? Or maybe there's a term you hear all the time - but have never been quite sure what it means?